A manufacturing company with a staff passionate about off-roading has launched a range of aftermarket products for four-wheel-drives. The initial range includes, winches, sand tracks, roof tents and a radiator grille fitted with high-performance LED driving lights. South Australian company Axiom Precision Manufacturing began in 1979 as Diemould Tooling in Adelaide and was an OEM manufacturer for the automotive industry. But as Australia’s auto industry started to wind down towards closure about five years ago, Axiom was already on the path to a diversification that is now helping it thrive again. “A lot of businesses probably threw their hands into the air and blamed others but Axiom actually said ‘it’s happening so what are we going to do about it’? Business Development Manager Peter Howard said. That direction has been spearheaded by defence, aerospace and medical devices with Axiom completing work for numerous defence primes including ASC, Raytheon Australia and BAE. 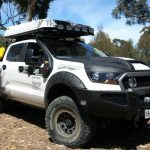 Axiom launched its aftermarket automotive equipment brand AX4 at last month’s Adelaide 4WD and Adventure Show with initial products including winches, rooftop tents, recovery kits, sand tracks and tailgate covers for transporting bicycles. The brand was born out of a passion for off-roading shared by a number of Axiom staff. Howard said the company’s precision manufacturing capabilities, hands-on knowledge of the segment and experience making automotive items had it well placed to design and develop quality products that would do well in the market. “We’ve all got slightly different interests: some are your true off-road four-wheel drivers who don’t want to see a power point for weeks on end so they’ll go as remote as possible,” he said. “Others want to ride their motorbikes and push bikes off-road and their four-wheel–drive enables them to get to places where that can be done and then there are those who just want to do general travelling across Australia. Axiom is working with retailers and distributors to carry its AX4 range. It has also launched its website for online sales. “We’re not really looking to become another retail store of four-wheel-drive products, we really want to bring something new to the market and leveraging our experience and expertise in the engineering field is something that is a good point of difference for us,” Howard said. Axiom has partnered with another South Australian company, Lightforce, to produce a replacement radiator grille with an integrated pair of Lightforce’s high-performance Venom LED driving lights. The X Grille is designed to be rigid and durable to eliminate the need for any extra mounting bars or rails, and supports each light at three points to provide precise alignment adjustment. The AX4 product has been designed to fit a Ford Ranger PX2 and PX3 models with similar products to suit Toyota Hilux and Holden Colorado to be released in 2019. In 2017, more than 42,000 new Ford Rangers were sold in Australia, making it the second most sold vehicle behind the Toyota Hilux with 47,000 sales. 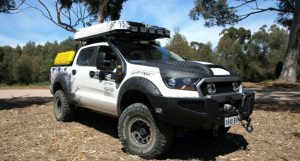 The Australian-designed Ranger is now in production in Michigan ahead of its US release in early 2019. It is also sold in more than 200 countries around the world making the product a potentially lucrative export item. The X Grille eliminates the need for bull bars, nudge bars or bulky mountings to add driving lights. It is available for pre-order with the first deliveries expected in the new year. The product was soft launched at the Adelaide 4WD and Adventure show in South Australia in late October and was on display at the Lightforce stand at SEMA in Las Vegas this month – one of the world’s biggest auto specialty product showcases. Lightforce is also headquartered in Adelaide and sells its lights in more than 50 countries , including the US where it also has a manufacturing base. “The key things with the partnership between Axiom and Lightforce is we are both well-established South Australian businesses and we have worked together previously on some pretty good projects but never in a co-branded product,” Howard said. “Lightforce’s international market is certainly an advantage but Axiom is known internationally as well. Each Venom LED contains 21 LEDs that operate at the optimal colour temperature of 5000K, allowing drivers to see colour and contrast at night, promoting safety and reducing eye fatigue. The pair of Venom LEDs deliver 1 lux of usable light 850 metres down the road and are shielded to prevent electromagnetic interference on UHF and AM radios. Modular filters are available to suit different applications – yellow for fog, blue for snow, and clear filters for different beam patterns. Lightforce Chief Operating Officer Tarnia Conti said unlike some bull bars and other light mounting solutions, the X Grille did not affect the car’s safety rating or interfere with the sensors in modern vehicles. “Increasing numbers of 4WD and SUV owners are choosing not to fit bull bars,” she said. The X Grille kit contains a wiring harness, switch and connectors – everything needed for a seamless fit. Instructional videos will provide a step-by-step guide, making installation a straightforward DIY job. Alternatively, owners can choose to have the X Grille professionally installed, a process that takes under two hours.